Coveted for their sentimental value and beauty, engagement rings remain the most treasured jewelry item of a woman’s lifetime. This ring symbolizes a moment in time establishing the commitment and lifelong agreement made between two people. It is for this reason that such rings, symbolic of love, are the most sought after heirloom-jewelry to be passed on from one generation to the next. Once only received by figures of royalty, these rings are now a tradition that every future bride eagerly awaits. The first recorded gift of a ring to symbolize such a commitment was given to Mary of Burgundy, by Archduke Maximilian of Austria in 1477. Centuries later, engagement rings are worn by women across the world. Typically set in gold or platinum with a prominent diamond elevated at its center, modern rings are often articulated with side stones for ornamental value. With countless styles available online and in jewelry showrooms, we have far more to choose from than even the Archduke himself could ever have imagined. When selecting gifts as important as diamond engagement rings, it may please you to know that you can work directly with the designers. At Jewelry Designs our artisans create each ring in our jewelry shop, one ring at a time. Our team of prominent jewelers toils to create premier, cutting edge designs with workmanship that rivals the spirit of old world craftsmen. The works of our jewelers are showcased in a wide variety of styles ranging from traditional solitaire engagement rings, to popular halo engagement rings and more. You will even find three stone engagement rings set with a trio of stones if that is more to your liking. If you are tired of mass produced styles, we can help you to find refreshing alternatives in our designer collection. From original new releases, to traditional designs with a personalized twist, the works of our master jewelers will inspire you. If you do not find a look that you love in our collection, our artisans will proudly create original custom engagement rings just for you. Both online and in our showroom, you will see original styles unlike any other. Our collection of unique engagement rings is only available through Jewelry Designs. Unique in design, many of these rings borrow techniques from old world artisans. The extreme attention to detail and quality of workmanship are reminiscent of vintage engagement rings from the bygone eras of our past. While contemplating styles, you will need to consider the shape of your diamond. The perennial favorite of most is round. There seems to be no question that round engagement rings are the benchmark by which all others are measured. Perhaps this is because the round brilliant cut diamond is unsurpassed in fire and brilliance. If you are not fascinated by other shapes your decision should be easy, round is a great way to go. Still, if you are not as inspired by round diamonds, you will without a doubt be intrigued by the wide variety of shapes there are out there. Such fancy shape diamonds can provide dramatic alternatives than that of more traditional round stones. For instance, maybe you prefer to maintain the soft feel of a round, but with a unique flair. Then consider the graceful elongated profile of oval engagement rings. 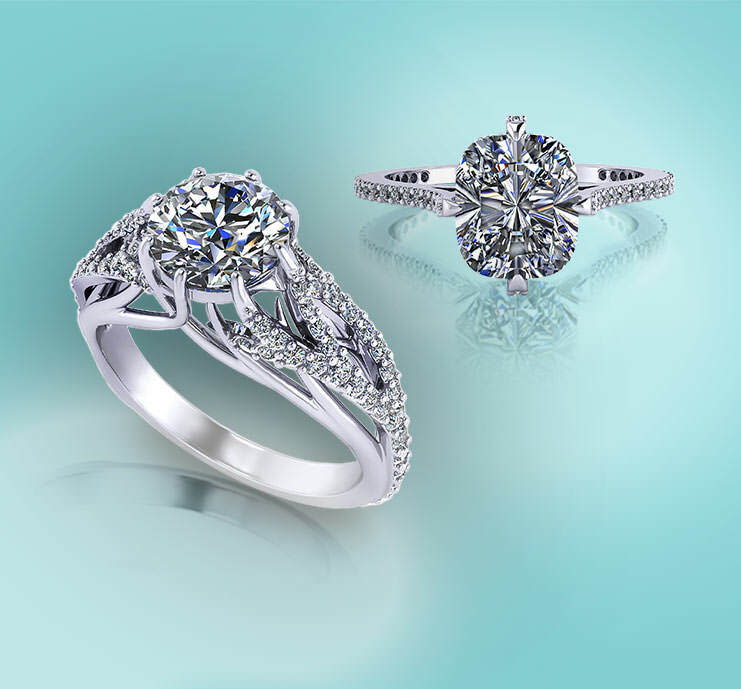 The oval diamond works perfectly in most traditional engagement settings. The extra bit of length adds a touch of elegance that separates it from other ring styles. Likewise, the soft pillow shape of cushion cut engagement rings, with their subtle billowing corners, are sought after by many. Cushion cuts have risen to popularity in larger sizes and are adored by many for their full body and brilliance. For those who are not keen on soft round edges, the search can broadened to include square and angular styles. The most popular are princess cut engagement rings. Princess cut rings feature a beautiful square diamond that radiates strong brilliance and provides dramatic contrast with surrounding accent stones. If you are searching for a slightly more conservative square shape, emerald cut engagement rings offer a distinct style. Many women are enamored by the elegance of emerald cut rings, as they possess the subtle inner glow of a prism reflecting in sunlight. For women desiring a diamond that accentuates the length of the finger, pear shape engagement rings are beautiful, with an elongated tear drop shape. Or for an even more dramatic span along the finger, no diamond can over-exceed the length than that of marquise engagement rings.